I'll always be with you, Annie. Literally. It makes sense though. So that's pretty sad. I think someone wrote it in a previous thread, too. And since then I thought that it had to be like that. When it's like this for Annie then for Reiner&Bert, too. I wonder when Annie gets out of the crsystal if she can answer something so we can now it for sure. I don't know how else we could find out that they ate their relatives. 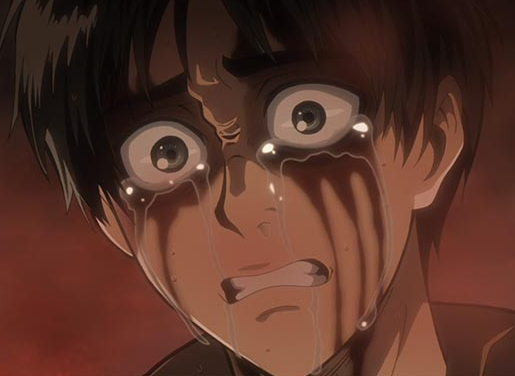 Of course Eren is now pretty apparent but we still do not have a confirmation. liala wrote: I think someone wrote it in a previous thread, too. And since then I thought that it had to be like that. When it's like this for Annie then for Reiner&Bert, too. That's true. Nothing can be confirmed unless they literally say so in the story. I'm kinda worried about Hanji, Mike die some time ago and now her whole squad. How is she gonna take it? KaiserSenpai wrote: I'm kinda worried about Hanji, Mike die some time ago and now her whole squad. She'll just do what she always does. Soldiers on and gets closer to the truth. LEVI, it would be more likely for her to blame Levi or pull a Misaka and go out there fighting without thinking. Hanji has probably lost hundreds of comrades by now. Do you think just now, she'll start cracking under the pressure? A7X Rogue Titan wrote: Hanji has probably lost hundreds of comrades by now. Do you think just now, she'll start cracking under the pressure? Well not every Shifter had to eat another Shifter. If that were the case, then how did the first Shifter get created? Yeah... I forgot that you're right. But AnnieReinerBert and also Eren most likely did eat another Shifter. Well, we don't now for sure yet but it is heavily implied that he really ate his dad.